Excena Foer, the star known as Aura, had an innocuous start to her show business career, being somewhat of a dancer prodigy. Her parents, Gallente workers both, strongly encouraged her on this path, and by the time she was fourteen years old she was already dancing professionally. Their dominance over her life and career rankled, though, and when she turned sixteen she broke away and started hanging out with the Mind Clash crowd; intense men whose talents and self-control on the digital field often belied volatile personalities and bloated egos. She later admitted having had some rough experiences with the more forceful competitors, but has consistently refused to elaborate. As it turned out, she was quite adept at the game herself, joining in the amateur leagues and using her natural talents for body control and utter inward focus to crush the competition. I am here to speak about Cathedral of the Oceans, and The Book of Hours, and how they are one and the same. It is a beautiful poem, in all its versions, and for that I am infinitely thankful, for poetry is not beautiful except by accident. You put everything into it you can, and then you let it go, trusting in your unconscious parts, the places where your eyes don't go, to have prepared it sufficiently for public scrutiny. It ended, as all things do, in ruin. Her name had become more and more entwined with Johaan Carve, one of the leading professional competitors, and when he was caught injecting psychotropics - forbidden in Mind Clash, since the risk of panic attacks and breakdowns is a very real part of the sport - and forced to leave the league in disgrace, she was dropped as well. Excena, who at that point had dedicated her life to the Mind Clash games, took it very hard. She kept dating Carve, but Clashers without fights are a self-destructive breed, and a descent into addiction and darkness soon followed. She spent a few years floating around, living off past fame and unreliable friends. Every now and then there'd be a slight resurgence in popularity - most notoriously the segment Scope did on her, where she made a remarkably loquacious and thoroughly intoxicated appearance - but by and large, she was sliding further and further into hazy obscurity and disintegrating health. Does the poem's beauty stem from the poet, then? Not in the least. People want us to be saints, but in all honesty, nobody who transcribes God's music can be a good person, not if they want to traverse the whole scale. You can be kind, but you can not be good, and even so, your kindness is not a thing in and of itself; it lives and reacts like an animal. Excena has been kind, Excena has been very kind to me, and if hearing that surprises you, you should reflect on the myriad of ways in which a young, energetic woman with more vigor than sense - and she'll forgive me for this, because she is kind - could make misery for an old man with whose life she has become intertwined. Excena has been kind, and she has told truths. Do not expect us to be good. This all changed when she encountered the works of Itzak Barah, Amarr's foremost religious poet. While stories differ on exactly when she fell under the spell of his poetry and how swiftly it happened (Excena herself persistently maintains that she loved it right from the start, but Carve, who she was intermittently seeing at that point, has claimed that she read only two pages of Barah's Other People's Lives before throwing it at his head), it is undeniable that she ended up taking a keen interest in it, to the point where she even attended reading sessions by local Amarrian scholars. Before eventually being asked to leave, as her presence there was supposedly beginning to mislead the local young clergymen, Excena had already built up a reputation for piercing insights into Barah's poetry and for her ability to restate his points in Gallentean. As an aside, we were having dinner recently at a very nice restaurant, and we were accosted by someone. The man called Excena some vicious names for having dared to translate Cathedral, and he said that she had murdered the poem. In one swift movement she rose, grabbed him by the neck, kicked the side of his knee and spun him around, slamming him onto his back on our table. She grabbed her steak knife, clicked it up to full power and plunged it into the table right beside the man's neck, nailing him to the table by his robe. And she looked deep into his eyes and said, "That fire you feel is nothing to mine. Nothing." Her breakthrough came when she translated Barah's opus, Cathedral of the Oceans, from its native Amarrian to her own Gallentean, publishing it under the title The Book of Hours. She would later claim that what had helped her accomplish this momentous task was her Mind Clash experience and its lessons of absolute focus and concentration, lessons which had helped her survive through years of self-abuse and narcotics. So we know that a poet may be kind but not good, and by the same token, of course, he cannot be evil. Can we say what he is? A poet is a chronicler. He is a recorder, trying his best to capture the music in letters. And that's wrong, entirely wrong. A poet must transcribe far more than that, not be content with the rhythms of his language. He is a conduit, piping God's dreams to dead words. And that, too, is wrong. A poet must never presume to be the connection between God and Man. He is a creator, showing the world how he experiences it, and thus creating it to himself. Good heavens, no. A poet has more humility than that. Are there other opinions? Thousands. Most of them are wrong at some level, or they conflict, and yet even those at complete odds with one another fail to produce a single acceptable definition between them. Amazing. And yet there are those here in this very room who would say that by discounting these definitions, of poet as chronicler, conduit and creator, I have failed; that they are true. And of course they are. In someone's ears they will be, but in mine they are not. It is in fact impossible to nail down what a poet is, and thus entirely futile to claim that someone is not. We do not even play the same song; how can we possibly claim to know the mind of every orchestrator? You may look at someone and say, "Yes, he is a poet" but you cannot look at someone and say, "No, he is not." Whether his words have meaning to you is, of course, a different matter, but that understanding is not his concern; it is yours, and we put the onus on the reader to truly read the poems, to glean their meanings. Her translation turned her into a star. It was almost universally hailed as a masterpiece, and had religious scholars up in arms. It was a complete reworking of Barah's poem to such a degree as to render it almost unrecognizable, throwing out all the imagery, pacing and symbolism in favor of original, Gallente-centered renderings, but which nonetheless produced a piece that was remarkably similar in spirit and approach. Barah himself gave his explicit approval of the effort, and in a famous speech given to an assembly of various Amarr and Amarr-affiliated religious leaders he declared that not only was Excena's translation a near-perfect transcription of the spirit behind his original version, but that she may not be castigated, threatened or assailed for her writing. At the end of his speech he cemented this opinion by declaring a Kaoli on her person and profession, indicating that any attack on Excena's poetry or Excena's ability to express it would be considered an attack on himself and, under religious law, would be avenged as such. It was a risky move, one that could have had Barah himself put on the deathlists, but it worked, and the Kaoli was grudgingly accepted by the religious majority. If I could write a poem without words, I would, but any time I look around I realize that God has beaten me to it; and so I commit my humble failures in the trust that they will be received in good heart by the reader. For poetry is - and here is yet another incorrect, insufficient description of the art, from a humble mortal trying to convey the godlike - poetry is a cooperation between writer and reader, for just as much as the writer attempts to float the heavens down, the reader must rise to meet them. Have you ever tried levitating? It is most difficult, I assure you. Excena went on numerous well-publicized speaking tours, where she would read out sections of Cathedral and of other, lesser-known poems she had translated, and would speak at length of her experiences with Amarrian poetry. In stark contrast to Barah himself, who was known as a soft-spoken and calm man, Excena was a forthright and sometimes contentious speaker, entirely unafraid to offend or disagree with her listeners. The Gallente universities loved her. And so it went, her scholastic renown rising, until the night where a group of religious zealots gained access to her drinks at the lecture's backstage room, and poisoned them with esophageal nanomachinery. The vicious little critters were programmed to gobble up a very specific kind of white mucus membrane, the type that can be found in only one place through the whole human body. The vocal cords. Should we treat the poetry as religious screed? Absolutely not. A man of faith must be the eternal doubter, because that's the only way to distinguish God's truth through the endless barrage of lies we're faced with, but not only that; he must possess the capacity to look at the lies, look straight at them, understand them for what they are - challenges, not of your faith, but of the way you view your faith - evaluate them and understand why they question your beliefs ... and then let go of them. All they do is distract you. Do my poems have meanings to you? I'm honored. Do Excena's? She would be honored as well. But if they do not, cast them aside. Do not treat them as affronts to your faith; treat them as lies and let them go. The world was outraged. The group of zealots was entirely unrepentant, claiming that they had not interfered with Excena's ability to create poetry and thus not violated the Kaoli, but soon after they found themselves hauled in by Speakers of Truth and stricken off the Book of Records. Meanwhile, offers of support for Excena poured in from all ends of the universe, from scholar and journeyman alike. She was offered free health care, but the esophageal nanomachines had done a thorough job, their only remains the gossamer tendrils that hung limply on the inside of her scabbed throat. Regrowing them, and training her body to use the new set, would have taken her years, even decades of painful treatment. Cloning was not an option, either: Aside from the legal difficulty of using that procedure for regeneration - it was and remains a contentious issue in every society - it was both dangerous and expensive, and a new body would have invalidated the Kaoli and given the zealots free rein to kill her outright. Excena herself was against it, too, as she felt it would signal a surrender, a defeat in whatever battle she was engaged in with these people. Yes, the poem is completely different. Yes, it's now Gallentean, unrecognizable to anyone who reads it solely as an Amarrian and not as a human being. The scene where the man drags the suitcase in the snow, so that its wheels don't even roll, and it just scrapes up the snow, that scene didn't belong anymore. Its replacement, the man who discovers another man in the street, crying, and it slowly dawns on him what the person did - it fits. It's beautiful. It ties everything else together, and if you excised that particular scene, you couldn't make any sense of the rest; not the imagery, not the pacing, not anything. Only a poet, whatever else they may be, can form and reform like that. So she used the proceeds from her tours, and the money from various donors, and had a voicebox installed. The procedure was quite rare, not only because of how incredibly agonizing the first few months could be, but of its failure rate. An astonishing 90% of recipients never gained full control over the boxes, and a full 50% could hardly use them at all. But then, 0% were ex-Mind Clash fighters and professional dancers. In one week she could make the box hum, a sound reminiscent of a rock crusher in the slave colonies. In a month, she could speak three consecutive words; in two months, three sentences. In half a year she was speaking fluently, her only issues a lack of control over volume and pitch. And nine months after the operation, she was back to normal and beyond it, having achieved a measure of control over her voice that she had never before enjoyed. No one else had ever adapted so well to a voicebox, and it was not even thought theoretically possible. The only lasting remnant of the accident was a tendency for her voice to sound metallic, but Excena later admitted that she loved the effect and had intentionally kept her voice like that. No drugs, and no divine inspiration. The first is the leaden darkness weighing down your eyes and the second is the wind blowing through your hands. The reader can tell when drugs have been at work, because even if by some lucky coincidence the language happens to glow, the rhythms will be dull, like lead slabs toppled onto a pavement. As for inspiration, it touches you every now and then - usually when you're least ready for it - but if you haven't put in your time, you will be unable to channel it. You will be a broken circuit, giving out only noise. It's persistence, is what it is. Persistence and tenacity, and endless practice. This poem and this ability did not arise from nowhere, and as much as Excena would like us to believe otherwise, she has been doing this for a long time. Perhaps not in the way she does it now, perhaps only in secret, but speaking of her as a poet it can well be said that all her efforts, seen and unseen, have safely and inexorably led her here. Her persistence and strength of character, and her newfound vocal ability, made her a star for the third time. She was inundated with offers for public speaking, for voiceovers, even for small speaking parts in the reels. A lifetime of conflict had left her worn and aged beyond her years, which prevented her from graduating to full movie stardom, but for a while she was a fixture in the Gallentean art reel circuit. And there came a point where, by her own admission, she started at last to think of the future. At each stage of her life she had been enraptured by the present, and while she had made a good living, she had also been entirely unconcerned about saving any of it for later years. So when that one offer, the most lucrative one of all, finally came around, she grabbed it without hesitation. It's well known that any job to do with capsuleers will bring in respectable money for the lucky, and this one was no exception. 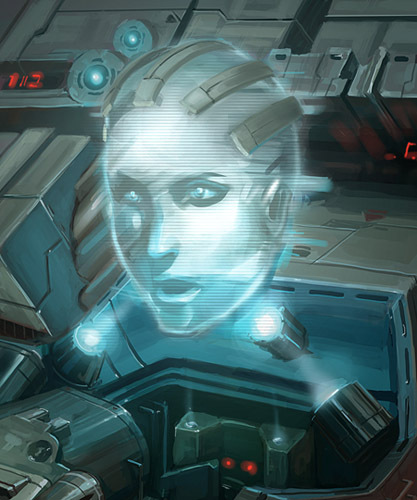 Her metallic, worn voice was perfect for the task of voiceovers for the AI on capsuleer ships. The immortal Aura was born. So we wait and hope. We wait and see where we go from here. Will she succeed? I certainly expect so. She's a strong woman, and she will go places I have never even approached. But she will not go there unsupported. As should be utterly clear from this little talk, I believe in Excena, in her talents and in her judgment. I give my complete sanction for her translation, and while I cannot make anyone else do the same - we are all of us readers, and all of us the listeners of the silent music - I can ensure that they do not stand in her way. By the power vested in me by my acknowledged status as an Amarrian religious poet, by virtue of my unblemished record both religious and secular, and before the eyes of slaves, equals, royalty and the endless God, I declare a Kaoli, a fellowship of paths, for Excena Foer and myself. Let her never be silenced. Let her never be less than a poet, burned pure in the eyes of God. Let her voice ascend to the stars.